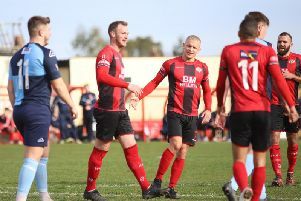 Kettering Town hit top spot in the Evo-Stik League South Premier Division Central after a stunning late fightback saw them beat title rivals Stourbridge 2-1 at the War Memorial Ground. Tom Knowles, who joined the Poppies on loan from Cambridge United last week, was the unlikely hero as his fine stoppage-time free-kick secured the dramatic finish to send Marcus Law’s team two points clear at the summit with two games in hand. In front of a bumper crowd of 1,734, A goalless first half saw Dan Holman rattle the crossbar for Kettering while Leon Broadhurst went close for Stourbridge as he was just unable to get on the end of a cross. The Poppies were dealt a blow when Aaron O’Connor was withdrawn due to injury while Declan Towers was also forced off at half-time with Adam Cunnington and Brett Solkhon replacing them respectively. It was Stourbridge who opened the scoring with 14 minutes remaining when Broadhurst was on hand to score after Paul White fumbled a cross. But the Poppies produced a fine comeback, which was started when Solkhon finished off a Marcus Kelly shot across goal in the 86th minute. And just when it seemed honours would end even, Kettering were awarded a free-kick 25 yards from goal and Knowles stepped up and found the top corner to send the travelling fans into raptures. Corby Town maintained their push at the top end of the Evo-Stik League South Division One Central with a fine 4-1 victory over Bedford Town at Steel Park. The Steelmen opened the scoring from an unlikely source when Delroy Gordon volleyed in his first goal for the club from a Jordon Crawford corner. The lead was doubled 10 minutes into the second half when Connor Kennedy skipped pasted a couple of challenges and then fired a low show past the Bedford goalkeeper. The visitors were handed a lifeline when Ben Ford fired home but the Steelmen rattled in two more goals to finish the job. A good one-two between Kennedy and Crawford saw the former cut the ball back and Joel Carta was on hand to score. And it was top scorer Elliot Sandy who had the final word when he picked the ball up on the edge of the area and sent his shot into the bottom corner. With leaders Peterborough Sports and second-placed Bromsgrove Sporting both winning, Steve Kinniburgh’s team remain in third but well in the hunt.